I have played Blood Bowl since 3rd edition. I was very sad when the last boxed set was discontinued with the demise of Specialists Games. I had never gotten around to purchasing it and always depended on the kindness of others for templates and the pitch. I currently have 3 Blood Bowl teams, Skaven, Khemri, and Chaos. Only the Chaos team is the old official models, and the other two I bodged together with Warhammer Fantasy kits. These teams have served me well for many years, and Blood Bowl is one of the games I have played the most over the years. Therefore, I was very excited when Games Workshop decided to reboot the Specialist Games line and decided to make the new Blood Bowl box set. I tracked it down and bought it from my FLGS. I also bought the new Death Zone: Season One book. The format of this review is going to be different than most of my reviews. Not enough has really changed for me to do my normal breakdown for most of my readers. Many people reading this are probably pretty familiar with the old LRB. However, if you are not that familiar with Blood Bowl, I also have my standard review breakdown of the game too. Let’s go into the locker room and find out more. 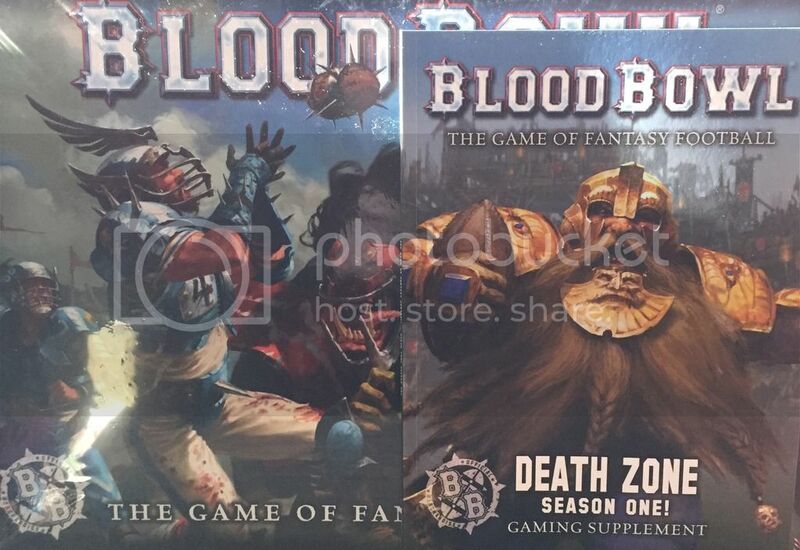 Re: Blood Bowl 2016- Review/What is in the Box? Good review and interesting to hear from an old hand rather than a newbie like me!